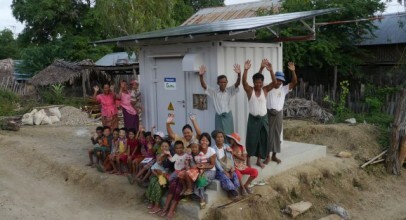 A village solar energy storage microgrid is helping save lives in rural Myanmar. Some 15,000 people living in Myanmar’s central Dry Zone are bitten by venomous snakes a year. Around 300 die as a result. Cobras and other types of vipers also take a toll on villagers’ livestock. A solar energy storage microgrid is helping improve the odds of surviving and making a full recovery significantly. Joining the MFL (Mae Fah Luang) Foundation’s Sustainable Alternative Livelihood Development Project, Panasonic and Mitsui & Co. shipped and installed a standalone, off-grid instance of Panasonic’s solar PV-fueled Power Supply Station in Yin Ma Chaung Village. The emissions-free electricity powers a refrigeration unit for the village health clinic, enabling staff to keep anti-venom on-site for the first time. In addition, Thailand’s MFL is providing training for health workers to help ensure snakebite victims (human or other animal species) receive the best treatment possible. The benefits don’t end there. Comprised of 12 Panasonic HIT PV modules, the 2.82 kWac Panasonic Power Supply Station includes a 17.2kWh smart lead acid battery energy storage solution (BESS) – 24, 12V/60Ah. In sum, the microgrid provides emissions-free electricity throughout the village, which includes 140 households in mountainous terrain. The solar-storage microgrid is brightening things up on village streets and at the village community center. Installation of time-switch LED street lights makes for highly efficient use of electricity, which, among other things, helps villagers spot snakes at night. Now brightly lit in the evening, residents have organized reading classes, study sessions and get-togethers at the community center. In addition, solar lanterns are lighting homes and residents to travel more safely unlit paths and areas at night. 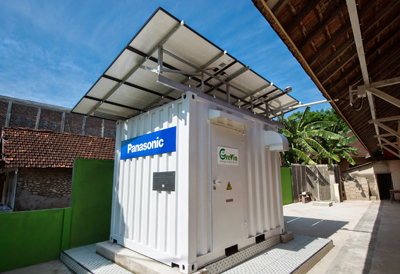 Mitsui & Co. donated the funds MFL needed to have the containerized solar energy storage microgrid system shipped from Japan to Yin Ma Chaung as part of its CSR (corporate social responsibility) program. Similarly, the project is the latest in Panasonic’s CSR-related activities, the overarching aim of which is to help solve issues of poverty, health, employment and others in areas without access to electricity and those struck by disasters.